It’s National Farriers Week! Lauren Nethery has a few suggestions for little gestures to show your farrier how much you appreciate all of his or her time and hard work. This article is a modified version of a story that was originally published on December 20, 2012. Let’s face it. Without our farriers, we riders and trainers would be up Excrement Creek without a water-displacing implement. Our horses would be lame, sore and elf-footed. From the most mundane routine care to extreme emergencies, our farriers are always there at our beck and call to take the best care of our dearest friends. While it’s common courtesy to have your horse caught, clean and ready for a farrier appointment, it’s also nice to do a little extra to show our farriers how much we appreciate all of their hard work and time spent on our horses’ hooves. 1. Gift cards are simple, basic, always needed, and do not require a trip to the mall. I suggest Starbucks, Panera, Cold Stone Creamery, Walmart, any gas station (BP, Shell, etc. ), or a special favorite establishment that your farrier just loves to treat themselves to. 2. Do not be afraid to employ the help of your practitioner’s spouses at a time like this. Ask their husbands/wives/children/apprentices what they really NEED. This can vary wildly and may take some creativity on your part. As an example, this year I went to the local farrier supply store and asked the boss man exactly what my farrier needed and he directed me to an elk horn hoof knife. My farrier swore up and down it was his favorite gift all year. Something that your practitioner can actually USE on a day to day basis is often the best choice when choosing a gift. 3. Custom-made leather work cannot be beat for a gift that isn’t too expensive but employs a personal touch and really makes a statement about how much your appreciate your practitioner’s work. I went to Linda Scott of Linda’s Leather (859-321-7284) and she has made me everything from nameplate bracelets and belts to full chaps for me, farrier aprons, and everything in between. 4. I have found that my farrier’s children, especially if they are under the age of 10 or so, are their entire world. Sentimental gifts “for” your practitioner’s children will sometimes bring them even more joy than gifts for themselves. This can be any number of things from a longed-for stuffed pony from Build A Bear, to a miniature version of something Mommy or Daddy uses, to breeches for the budding equestrian. Again, creativity is a plus! 5. With all of the bumps, kicks, bites, and bruises that most farriers endure on a daily basis, consider a gift certificate to a local spa for a day of pampering. Even for the male farrier, a massage can go a long way to alleviating those sore shoulders/backs/legs. Places like Massage Envy offer introductory massages for $39! 6. All of us that are professional horsemen and horsewomen have a hard time getting any time to ourselves. Consider a gift certificate to a hotel chain or to one of those little log cabin companies in your local recreation area. These usually range in price from $50-$120 per night and have at least a year’s worth of validity. While your horse will invariable choose that weekend that your farrier is gone to pull a shoe, I promise you they will appreciate the down time. 7. If you own or operate a business or farm, anything emblazoned with the establishment’s name and logo are both great advertising and still contain that personal touch. Last year all of my boarders and clients received key chain sized “swiss army” type multi-tools with the farm name and logo etched into one side. This year, all farm and business related associates received toboggan type hats (in different colors and styles depending on the individual to add a little personal flare) with the farm logo and their names embroidered into them. Both the hats and the knives cost around $10 each including personalization and were very well received by all. 8. 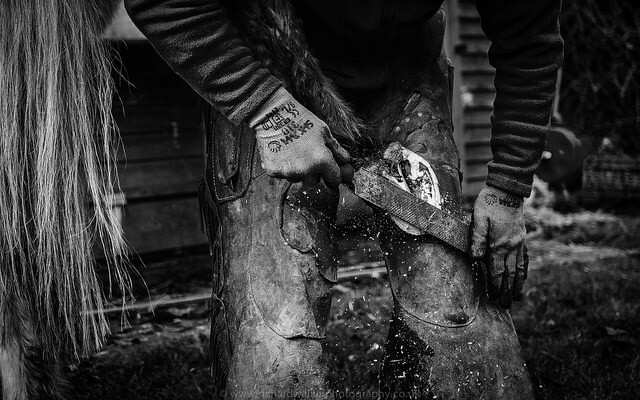 Speaking of attire, all farriers spend entire MONTHS of their lives out in the elements. No horses ever seem to get sick or throw shoes when it’s sunny and 60 degrees outside. So in the spirit of keeping your favorite people warm and dry, consider a very nice piece of outerwear to complement their wardrobe. For the budget minded, a good pair of gloves or Smartwool socks can really do away with that winter chill. Good boots, a nice rain jacket, or a fleece pullover all are needed and appreciated as well and can even include your logo as you see fit. 9. We all know the quickest way to a man’s (or a woman’s!) heart is through his stomach. A box of chocolates, bottle of wine, gift basket from your local bakery, or even a loaf of homemade zucchini bread is sure to bring a smile to their face and chase the rumble from their bellies. 10. If all else fails and you cannot come up with a suitable gift for one or more of your favorite equine caretakers, a handmade gift (which can often be FREE!) that can be as simple as a framed picture or a card drawn by your own hand or even a letter expressing your gratitude for all that your farrier does for you can really mean a lot to the giftee. [Editor’s addition: I made mix CDs for my farrier team who had to travel over two hours round trip to get to my barn — they appreciated the personal gesture, plus they discovered a few bands they found out they really liked!] Again, it’s the thought that counts and as long as you let those that keep your horses sound and healthy know how much you appreciate them this and every National Farriers Week, that is all that matters!